Off to SBL in Atlanta! It is time for the annual meeting of the Society of Biblical Literature. This year we meet in Atlanta. I have a number of papers I want to hear and people to see. Perhaps I will buy some books this year. I find that I buy less and less each year. In fact, last year I bought nothing. I can usually get better deals elsewhere and then I don't need to carry them home on the plane. I am not giving a paper this year. I make it a point to do so every other year. I am a bit gutted that Brill won't have my book published in time for the conference, but perhaps they will at least have a cover. Oh well. Few are going to spend the $120.00 they want for it. But I am looking forward to my first ever Bibliobloger dinner. This will be a meeting of many of those who blog on any number of topics in biblical and theological studies. I look forward to meeting some of these people for the first time. I am still quite new at this, but I have been having a lot of fun. Over the years there has been a lot of debate about the location of Jesus' tomb. The traditional location has been inside the now Church of the Holy Sepulcher. This site was first identified by Constantine's mother in the fourth century. At one time there was a tomb in the center of the church, but it has since been destroyed. Nonetheless, even today visitors can see tombs from the second temple period that are now part of the church. Since the nineteenth century many Protestants have claimed the Garden Tomb (aka Gordon's Calvary) as the location of Jesus' tomb. Unlike the Holy Sepulcher, the Garden Tomb is located outside the walls of Jerusalem. This would seem, some argue, more accurate since Jews would not bury their dead within the city walls. While the Garden Tomb is certainly a beautiful and inspirational location, the facts work against it. First, the tomb is not a second temple tomb. It is much older and if we are looking for Jesus to be laid in a "new tomb" then this won't do. Also, those who point to its location outside the walls of Jerusalem fail to realize that the Garden Tomb location was also within the walls at one time. Beginning in 40CE the city of Jerusalem went through an expansion which saw the location of the Holy Sepulcher and the Garden Tomb both end up within the walls. The current walls of Jerusalem were not built until the 15th century. I am unaware of any archaeologist who would point to the Garden Tomb as the location of Jesus's burial. There is an interesting article in Bible and Interpretation today that looks at the possibility that Jesus' tomb, in the now Holy Sepulcher, was intended as a temporary tomb. Eldad Kenyan has previously argued that the Holy Sepulcher is the correct location of Jesus' tomb. Today he looks at what Jewish law has to say about moving the dead and whether or not Jesus' placement in Joseph of Arimathea's tomb was intended to be a temporary measure. In conversation with Amos Kloner, Kenyan notes that the placing of Jesus in Joseph's tomb could have been problematic since it was Joseph's family tomb. Kloner suggests that it was a temporary burial until Jesus could be moved elsewhere. He notes "
Privately owned tombs were meant to cover familial and public emotions – they were designed to prevent the presence of unwanted strangers and any "leak" of the corpse's defilement out of the tomb. Since the Sanhedrin owned its tombs, it could "lend" a burial place "on demand" when the Sanhedrin executed a Jewish felon. We've already seen that by law, felons' bodies had to "dwell" in the Sanhedrin tomb for a year. Since it was against Jewish law for a family to move a body, Kenyan argues that the best identification for Jesus' borrowed or "temporary tomb" would be a tomb owned by the Sanhedrin and used for just such a purpose. This might make sense since Joseph of Arithamea was a part of the Sanhedrin and would have had access to such tombs. You can read the whole article here. I found the discussion interesting but not completely convincing. There is a lot to the article and I cannot do it justice here. I suggest you read it to understand all that Kenyan is arguing. The biggest hurdle is the degree to which both Kenyan and Kloner use the Mishnah as an authority on Jewish burial. While many of the legal prescripts in the Mishnah probably have some connection to first-century practice, the fact is that these laws were not compiled in their current form until 190 CE. This means that a full 160 years had passed between the death of Jesus and the codification of the Mishnah. A lot can and does change in that time. Using the Mishnah as a source here presents at least three problems. It assumes that the all of the laws that were in vogue in 30 CE were still known and active in 190 CE. It is quite possible that there were other practices that were dropped or introduced during the interval. It assumes that the Mishnah is descriptive rather than prescriptive. What I mean is, it assumes that because something was legislated that it actually happened. We could point to many instances in which things happen that are contrary to the law. Just because something is prescribed does not mean that it always (if ever) happened that way. It assumes that we have enough information in the Gospels that we can use the Mishnah to interpret them so easily. But the Gospels do not promote a "temporary burial". Their focus is on the claim of resurrection. Thus while there are certainly some historical facts that might tease us, the authors were not trying to provide us a legal description of Jesus' burial. The purpose was to move the story on to its climax. Thus, a lot of important details are not present and makes a full legal analysis impossible. So while I still believe that the Church of the Holy Sepulcher is the best location for Jesus' tomb, I am not convinced that we can adjudicate whether or not it was a tomb of the Sanhedrin used for temporary burials. Cheating is epidemic in academia. It can take several forms. From looking over a neighbor's shoulder during an exam, to claiming to have read a book you never opened, to plagiarizing some or all of a term paper. Students do it and professors catch it, but I suspect most get away with it at some level. As a professor I pride myself on my ability to figure out when a student is plagiarizing. I seem to have a nose for it. I have also caught people cheating on tests. When I teach Greek I give a take home quiz. The students can study all they want, but when they take the quiz they are to do so with closed books. Over the years I have found a way to flush out cheating students. If a student does well on the take home quiz, but can't read a lick of Greek or parse their way out of a paper bag, I simply re-administer the quiz in class. I collect their quizzes and then handout the same quiz again. If a student cannot lay pen to paper I am pretty sure they are cheating. I knew that students cheat, but I had not realized the lengths to which they would go. A former student of mine alerted me to an article in the Chronicle of Higher Education. The article is an essay by an individual who writes papers for students. We have all heard of the companies that do this, but here is the confession of someone who is paid to do it ($66,000 per annum!). He also has been paid to take online classes. Here is his own confession. I have completed countless online courses. Students provide me with passwords and user names so I can access key documents and online exams. In some instances, I have even contributed to weekly online discussions with other students in the class. But in light of what I already know about the cheating epidemic, this is only mildly surprising. What did disappoint me, however, was the amount of business this person gets from seminary students. Here is what he has to say on that score. I do a lot of work for seminary students. I like seminary students. They seem so blissfully unaware of the inherent contradiction in paying somebody to help them cheat in courses that are largely about walking in the light of God and providing an ethical model for others to follow. I have been commissioned to write many a passionate condemnation of America's moral decay as exemplified by abortion, gay marriage, or the teaching of evolution. All in all, we may presume that clerical authorities see these as a greater threat than the plagiarism committed by the future frocked. When I read this I have to wonder what these students are thinking. These are people who supposedly have received a call to minister to the people of God and are cheating their way towards ordination! No wonder so many of our minsters are unable to articulate their theology or critically think through a situation. Some, although it sounds like a lot, are not doing the work laid out for them. They are buying it and somehow have rationalized that this is "OK". I think the essayist hits the nail on the head. Students seem to think that "doing ministry" is more important than the steps required to get there. They either want or need the MDiv degree, but don't want to do the work. They just want to get on with it. Why is this acceptable? Why are we willing to sit under a less-than-prepared minister? None of us want to go under the knife with a surgeon who barely made it out of medical school much less one that cheated his/her way through. Who wants to be treated by somebody who paid to have their papers written? Yet, somehow, this is "ok" for minsters. We all have our weaknesses and we all succumb to doing things that we shouldn't. But I still wonder what is going on in the minds of people who think they can cheat their way towards ordination and somehow God will be "ok" with it. Dwelling with Philippians: Book Notice. 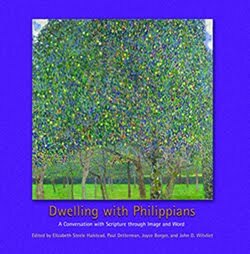 I just received a copy of Dwelling with Philippians: A Conversation with Scripture through Image and Word. (Eerdmans, 2010). It is a combination of commentary, spiritual formation guide and coffee table book. The focus of the book is to draw the reader into Paul's letter to the Philippians and to help them think about each section. The epistle is broken into sixteen sections each of which begins with the text of Philippians (NRSV). This is then followed by a meditative section that seeks to draw meaning from the text and the reader into the text. Next there is a series of questions that the reader can ask and contemplate as they give consideration to what Paul had to say to the Philippians. This section is concluded with a variety of images and words. From paintings to sculptures and Bible verses to poems the reader is treated to an experience that seeks to wed the cerebral themes of the text with the beauty of the world. Here is what the introduction has to say about the book. The goal of this book is to help us "let the word of Christ dwell in us richly" (cf Col. 3:16) and to allow the text of Philippians to form our imaginations so that we see the world in a deeper, more life-giving way. Dwelling with Scripture trains our capacity for perception, which helps us see more deeply into the truth about God and ourselves. It prompts fresh insight into sin and grace and forms us for a faithful, hospitable, and just way of life. To this end, think of each artwork in this volume as a question ("How does this artwork help us to understanding some aspect of what Paul is communicating?") rather than as a definitive assertion ("This, surely, is what Paul was getting at"). This book is not a substitute for traditional Bible commentaries or study guides. Historical, theological, and literary analyses of the text are each indispensable. But we are convinced that a book like this can be an instructive supplement to these kinds of studies by harnessing the considerable power of artworks to help readers grasp Philippians' gospel message. As a biblical scholar I am encouraged to see that someone is combining a commentary with spiritual formation. There are few that I am aware of that do this. Quite often the Bible is included in spiritual formation through an appeal to a couple of verses with little thought to the context or author's intent. This approach will help to encourage readers to consider using good Bible study as part of their personal formation. On a personal note, I am not much for worship-related arts. But overall I find it to be well done here. Not every image will appeal to every reader, but there is enough variety that I think many will find some that causes them pause. Many thanks to the Calvin Institute of Christian Worship and Liturgical Studies for this free copy. This might seem like an odd question to some, but it is finding voice more and more. I am told that there is a growing number of churches that are eschewing seminary training and opting instead to do it in-house. Rather than send people off to study with someone, well, like myself, some church leaders prefer to keep their people and their money at home. This seems to be a particularly popular idea in the so-called mega-churches. These are congregations with the numbers and means to plant and grow their own churches without the assistance of a formal denominational affiliation or an accredited seminary. Sometimes they consider the outcome of seminary to be less than helpful. Other times they just prefer to keep their members close to home. I wonder, though, what the long term effects of such a practice will be? Within a very short period of time it seems that if all education is accomplished within the confines of one church, or church movement, the danger of theological inter-breeding quickly surfaces. To what degree are these "students" being exposed to the wide variety of the0logical thought that exists? Are they learning about the various movements in church history or only their own particular and probably short lived history? Are they learning why it is important not to harmonize the Gospels and do they know about the important advancements in Pauline studies that have resulted from the New Perspective? Can they use Greek and Hebrew and can they articulate some of the more important theological doctrines? I could go on. The fact is, however, I don't know the answer to any of these questions. 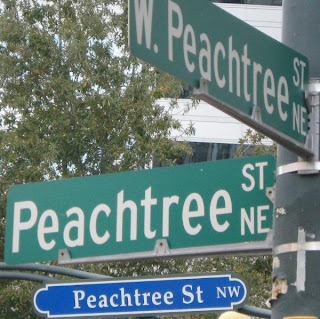 I only know that I keep hearing about this trend, but I have yet to actually meet someone from one of these churches. I would certainly agree that all theological educators need to think harder about what and how we teach our students. The old residential model of theological education is quickly dying. But I am not convinced that what we have to offer is no longer relevant. 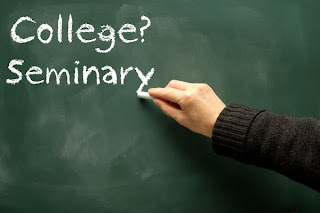 If you are someone that has opted not to go to seminary then tell me why. If you did choose to go to seminary tell me why. What are we not giving you that you need? I would be keen to hear from people outside the USA as well.